Tri-Fuel Kits use an adapter that makes it possible to operate an engine on three different fuels; Propane, Natural Gas, and Gasoline. Adapters will mix the Propane or Natural Gas into the air stream above the gasoline carburetor. The gasoline carburetor remains basically untouched. The photo above illustrates how most adapters install on an engine. Adapters are just that. They adapt to whatever carburetor an engine has and are installed between the carburetor and air cleaner. As you can see, the adapter is between the carburetor on the left, and the air cleaner assembly on the right. The Adapter has a hose running to it from the demand type regulator supplied in the kit. The center of the adapter has a venturi. A venturi has an opening in the middle and its shape resembles a doughnut. 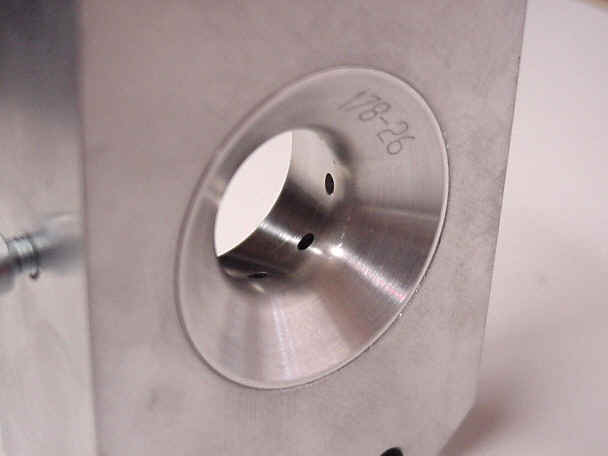 All around the trailing edge of the center opening are many small holes or slits. As air passes through the center opening and over the many small holes, fuel from the regulator is delivered to the air stream. How much fuel depends on how much air is passing over the holes which depends on how far the throttle is open. People often ask about power loss with the adapter style kits. We have never had a complaint about power loss with any of our kits. The use of a quality digital tachometer should show this to be true. A small readjustment of the main load screw will be required whenever the fuel is switched between Propane and Natural Gas. To use gasoline just turn one off an the other on. The engine runs on alternate fuel while the gasoline carburetor is "out of gas". So basically, adapter kits are not a conversion, they are an adaptation.